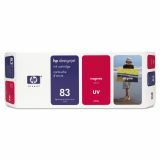 HP 83, (C4940A) UV Black Original Ink Cartridge - The HP 83 UV Ink Cartridges are part of a modular ink system that delivers fast printing automatically. The HP 83 UV color ink system and newly formulated pigment-based inks offer the smoothest color transitions offered by HP large-format printers. 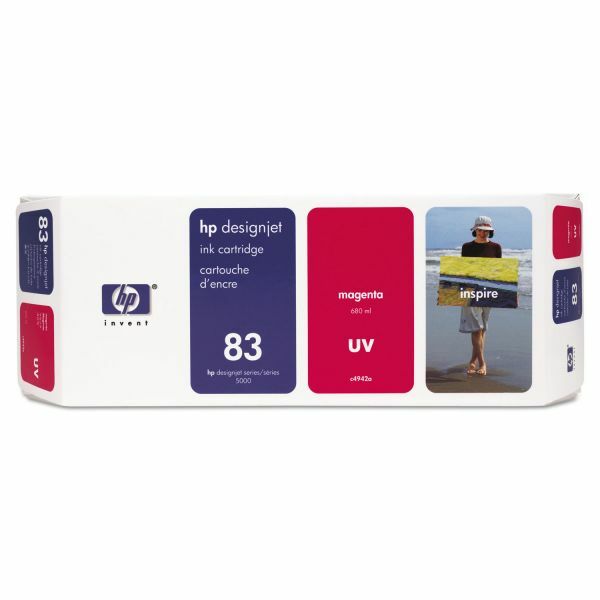 Designed for use with HP DesignJet 5000UV, 5000PSUV, 5500UV and 5500PSUV printers. Smart chips embedded in each of the HP 83 UV ink cartridges and printheads monitor ink usage, track printhead wear and alert you when it is time to replace your supplies. HP 83 ink supplies are HP engineered and tested to work precisely with HP DesignJet 5000 series printers and compatible HP printing material to deliver the professional results you expect.